I don’t know if it’s the time of year, but as the holidays wind down and the idea of a long winter indoors becomes a reality, I get a bit stir crazy and always tackle my spring cleaning much earlier than the name would suggest. While people are dropping the pounds at the gym, I’m usually found in the back of an old broom closet purging those bits of broken household odds and ends that have managed to stay hidden, waiting for a day of good intentions to fix them up, re-purpose them, or re-gift them to someone who would actually use them. 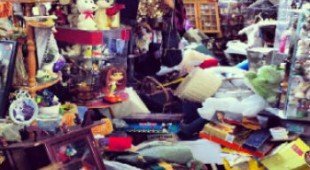 I’m not sure many would find as much joy in throwing out old toasters and bits of paper as I do, but if you are at all interested in the subject of de-cluttering and simplifying your life, then here is some further information to help you get started on your quest to less stuff in the new year. Our catalogue has a number of books on the topic of tackling clutter (both physical and emotional) and living a more simple, streamlined life. Not only is it a great way to purge items no longer in use that still serve a purpose, but it also helps the community in the form of donations. Charities in the area are always looking for household items and gently used clothing, particularly Coats for Kids (who are already building their supply for next year) and the Society of Saint Vincent de Paul. If you like the idea of de-cluttering, but aren’t willing to add another book to your reading pile, there are some online options as well. You can check out The More Of Less from Hoopla (one of many audio books on the subject) , or instantly download some music on Freegal in order to get you pumped up for your spring cleaning and organizing sessions. Whatever project you choose to tackle in the winter months, Windsor Public Library has information you need to help you every step of the way!